I could not believe my eyes when we were presented with this beautiful MGB sport car for its MOT test. I am just going to show the pictures so that you can see for yourself how nice this car is. SOME TIMES THIS IS WHAT A BLOG IS ABOUT. In my opinion was one of the signs that you were doing better in life if you owned one, I had the poor relation the MG Midget. I remember working for a Dunlop tyres subsidiary at the time and the MG was fitted with 165×14 Mainly Pirelli Cinturato textile radials. The guys who owned them (it was a man’s car and not many females owned one) were mainly self-employed builders and architects, this was the car for them. Of course, the fascinating thing to me though. So, was that out of the 387,000 cars produced 90% were sold in America. Consequently, where they were as popular as they were in the UK. Subsequently, these cars were built from 1962 to the last car in 1980. Hence, the first MGB GT versions rolled off the production line, in 1965. As a result, by the end over 125,000 of these splendid cars were built. Of course, with about a third going for export. Selling well over half a million cars. Therefore, was the bestselling British sports car of all time. So, by this time the cars were fitted with more of the Dunlop tyre products. Working for a Dunlop subsidiary. Thus, meant that we had more and more of these excellent sports cars entering our auto centre. Of course, for tyres and car servicing. Over the years the MGB retained its popularity.Even now in 2014 there are many companies making and selling spare parts. You can even buy full body shells. Hence full body shells were launched by British Motor heritage back in 1988. Lastly, the shell was also used to produce the MG RV 8 in 1992. Valve operation: overhead operated by tappets push-rods and rockers. Largest Car Tyre-Could this be the worlds largest car tyre-Certainly the biggest I have ever seen? Pellon Tyres in Halifax UK are a member of a tyre buying group that go by the name of “Point-S”. Every year we are invited to a conference. Usually held at the same time every year, February. This year was no exception. As a result, we attended the beautiful “Belfry” Golf and leisure centre for the two day get together. The Belfry is North of Birmingham. Although not a golfer myself it is set in beautiful country side and is a most pleasurable experience to visit. Hence, the conference starts the day with a “market place” of suppliers showing off their latest products and anything else to do with tyres and batteries. It is a great place to meet up with old and new friends and acquaintances. The morning is followed by a Point-S presentation talking about last years figures and thing for the new 2018 year to come. The talk is always interesting and gives us chance to compare ourselves with the performance of others in similar businesses to our own in Halifax. This Lexani was by far the largest car tyre that I have ever seen in the UK. The tyre was fitted to a type of “Chevy” in America. However I did notice that on an American website called “Donk” that Yokohama make a 40 ins car tyre. For drivers who would like to increase their tyre size. Thus I would like them to go to an excellent tyre size calculator website to the calculate the desired tyre size for their cars. https://www.pellonautocentre.com/wp-content/uploads/2018/02/zzzzzza-american-car-with-32-inch-tyres-fitted.jpg 472 1314 Eric https://www.pellonautocentre.com/wp-content/uploads/2015/06/Logo_PellonCleanTrans.png Eric2018-02-19 10:03:492019-01-06 05:58:21Largest Car Tyre-Could this be the worlds largest car tyre-Certainly the biggest I have ever seen? Car Air-Conditioning (air-con)-Who would have thought that we Needed It? Air-con was one of the last things that you would have needed here in the United Kingdom’s cool climate, but now that we have it in almost every vehicle, I do not know how we did without it? This time of year is when our customers are starting to get their cars ready for the summer and this includes have their Car Air-Conditioning system serviced. better than nothing at all. In fact, it was Chrysler that was the first to introduce a properly integrated air-con system into their cars in 1953 as an optional extra. By 1970 almost half the cars in America were installed with Car Air-Conditioning and us in Europe were still miles behind. At the same time in 1970 the USA adopted a new “Clean air act”, but the regulations for motor vehicles did not come into force until 1990. This meant that the refrigerants inside the Car Air-Conditioning had to be re-cycled and a different refrigerant had to be used. The gas that we all use at the moment is the R134A, but we think that a newer gas will be used in the near future. European car manufacturers quickly followed suit and air-con was installed in all of the big production cars such as BMW and Mercedes and was quickly followed by the family car market, down to the small cars made by Citroen and the Toyota Yaris. The main parts of the car air-con system consist of the Air Conditioning Condenser Unit, compressor and evaporator and a few other parts that, these all work together to remove and cool the humidity that is in the air and circulate it into and through the car, the warm humid air is replaced with cool air at the temperature that you set it at. That is until things such as the Car Air-Conditioning Condenser start to go wrong. “It is false economy to turn the system off in the winter. This can lead to deterioration of the seals and gaskets in your system and, even more, rapid refrigerant loss. On the coldest of days turn the system on to ensure that the windows are demisted and the interior of the car is comfortable. Contrary to popular belief this does not greatly reduce your mpg or performance. With modern engines and increased fuel efficiency the cost of using your vehicle air conditioning system has been considerably reduced with modern advancements in engineering”. And the members of staff at the garage should all be certified to use the equipment and handle the refrigerant that is used, so check out the air-con before the summer arrives and keep yourself cool and dry. https://www.pellonautocentre.com/wp-content/uploads/2015/06/Logo_PellonCleanTrans.png 0 0 Eric https://www.pellonautocentre.com/wp-content/uploads/2015/06/Logo_PellonCleanTrans.png Eric2018-02-17 17:59:042018-02-17 17:59:04Car Air-Conditioning (air-con)-Who would have thought that we Needed It? SPARE TYRE and WHEEL WHICH SYSTEM DOES YOUR CAR HAVE? WHICH SPARE TYRE SYSTEM DOES YOUR CAR HAVE? As a tyre retailer for 40 years, this is an increasing problem for the modern motorist.When the car manufacturers had to make their cars lighter so that they could hit their emission targets, then they looked at many ways to lighten the weight of their cars to make them lighter including different ways of doing without a SPARE TYRE and wheel. The problem has been that the car makers did not come up with any universal and unified method of doing this, and so different cars have differing systems for the replacement of your spare tyre. The problem is that when you buy a car it is the last thing on your mind, to check out the spare wheel system for that particular model of car. Space saver; flat tyre systems. car tyre that actually resembles a motor bike tyre. The wheels are usually painted a bright colour, bright red or bright blue, to distinguish the spare wheel from the wheels on the car. The space saver car SPARE TYRE is a different size to the rest of the tyres on the car, but is the same overall diameter (height) so that when it is fitted to the car then it keeps a balanced driver experience, when the wheel is being driven on. The space saver spare tyre is regulated to 50 MPH when used because the tyre is much thinner and can only carry the cars weight at a slower speed.Once the tyre is fitted it is important to get your original puncture fixed and return it to the car, this will not then restrict your speed. The cars that are fitted with Bridgestone Run Flat Tyres do not have a spare tyre at all. The technology is in the actual tyres. When you get a puncture in a run flat the increased strength in the tyres structure supports the weight of the cars weight without having any air in. This is only a temporary fix and once again the car must not exceed 50MPH. The other downside of the run flat tyres is that because the tyre has been run on and they are usually damaged beyond repair and a new one is required. The main advantage is though, that if you do get a puncture then you can just drive the car at 50MPH in relative safety without the car deviating and the driver having to get out of the car and changing a wheel. usual case, in all my experience, most tyres succumb to side wall damage, or larger repairs that the emergency repair kit will not be able to cope with. The last car that I had with this system was a |Nisan Juke. Because we travel to France a couple of times a year, we needed a spare tyre so we found an alloy wheel that fitted the studs and fitted a new spare tyre, you will also need a small jack and a wheel brace, because these are not supplied by the car manufacturers. This is an easy thing to do if you have a friendly tyre retailer and well worth the effort to cover yourself in case you have a dreaded puncture in the middle of nowhere. The main gist of this though is to make sure you know which spare tyre system that is provided with your car and familiarise with it. Some car owners are lucky enough to have the old fashioned spare wheel fitted complete with a jack and a wheel brace. https://www.pellonautocentre.com/wp-content/uploads/2015/06/Logo_PellonCleanTrans.png 0 0 Eric https://www.pellonautocentre.com/wp-content/uploads/2015/06/Logo_PellonCleanTrans.png Eric2018-02-16 17:58:592019-01-06 07:17:09SPARE TYRE and WHEEL WHICH SYSTEM DOES YOUR CAR HAVE? thing to happen is if the jack is placed under a sill and not the re-enforced area just under the edge of car. Most models of car have a special re-enforced part at the front of the sill area and is marked by a notch in the metal to show you where you can jack up your car without it going through the softer sill part of the body just under the car doors. The jacking points are usually illustrated in the owner’s manual, but if you do not know where the jacking points are and are not sure, then DO NOT jack the car up, leave to a professional , who knows what they are doing. If you are confident or stuck somewhere with a flat tyre then this is something that you should tackle. The first thing to do is to make sure that you are on a HARD SURFACE. Please do not try to jack your car up on a grass verge or a field, anywhere that is soft. The obvious thing to happen is that the car jack will just sink, and unless you have some wooden blocks in the car then the job will be hopeless. Once you have established that the ground is hard enough then you should look for and remove your wheel removing kit from the car boot. This usually consists of a scissor jack, wheel brace and locking wheel nut tool (if your car has one). The car jacking point is marked by a cut out in the metal plate on the front and rear of the car; this shows the strongest place to jack up the car. Once this is all done then you can say a prayer and hope that the wheel nuts are not seized up or over tightened, from the last time that the wheel was removed. If the wheel is over tightened then you may have to get help or call out a nearby garage for assistance. Some drivers know about this and carry a hollow piece of strong metal tubing in their tool kit to give them leverage on their wheel brace. It is also wise to keep a small thick piece of wood in your tool kit to place on the jack as you start to lift the car. This gives the jack a better bite, instead of the metal on metal of the jack and the car sill. for a safer jacking experience, in my opinion good preparation is the word. It is no different in the professional garage, we have always to be safety conscious when jacking up cars, either with a trolley jack or on the vehicle ramps, the same should apply to the DIY motorists. make sure that you have some good strong axle stands to rest the car on before you commence working on your car and the same applies to a hard surface when lifting the car, all these points may seem trivial but as a garage owner of over 40 years, I have seen many stupid things happen, that were only due to thoughtlessness on the behalf of the mechanic. When jacking up your Used Cars you can get a feeling if the thing is not going right, so if you hear any strange creaking noises or metallic sounds then let the car jack down with care and start again, care is the buzz word. I suppose thinking about it; this is why the breakdown services are very busy, there are now many different types of wheels and jacks on today’s modern cars and if you are not sure or confident please join one of the motoring breakdown services such as the AA or RAC here in the UK. This year at Pellon Tyre and Auto-centre will be our 25th year in business. To celebrate we are holding a huge party for our customers and suppliers, who have supported us over the past years. In that time we have tried any many different trade associations to better us and the customer experience, by offering different things that would improve their experience when visiting our garage for tyres servicing or indeed general repairs. The two organisations that we are currently associated with are the best that I have had the pleasure to deal with. We have been a Unipart UCCC now for five years and have benefited our customers with the service that they offer. The Unipart UCCC garage network now extends to over 200 independent garages that operate throughout the British Isles. They consist of a blend of normal type garages, fast fit centres and other motoring organizations and are the largest network in the country (UK). Because we are all independent garages we probably carry out car servicing in slightly different ways, but we all work in the same ethical way offering our customers a top quality service with genuine monetary savings, that we must adhere to as part of our UCCC membership. The price list says 2012, but we are sticking to these prices for the near future. On some car models we will use the Autodata car servicing manual to give us the exact requirements for the customers car’s needs. Just to mention it , we do have the computer equipment to correct and re-set any of the cars service lights when the service is completed. Unipart original Equipment Quality Parts. Another bonus for our customers is that we use 90% of Unipart sourced parts to use on our customers cars. This ensures that we fit real quality parts when we carry out a service or repairs to our customers cars .We have to ensure the best parts because all our customers are covered by a Unipart Car Parts 12 months parts a labor guarantee, which is applicable all over the mainland UK. So if you are going on holiday, say to Brighton from Halifax and you had a problem with some work that we carried out, then you could take the car to the nearest Unipart UCCC depot and the problem would be sorted out for you to carry on with your holiday, a great bonus for all the Uccc Members customers. All Unipart Car Care Centres are signed up to the Motor Industry Code of Practice. The second great organization that I have joined has been Point-s.co.uk they operate an online tyre pricing system to compete with the other online tyre retailers, but the difference is that the pricing system is to help us local businesses compete with the huge national customers. When you buy a tyre through Point-s.co.uk tyre buying system, then the sale comes to us at local level, we are then contacted by the customer who arranges a date for the tyres to be fitted, This is a great system for a popular but local tyre centre to compete with the big companies, and it also means that our customers have a choice from where they can buy from, knowing that if they have a problem in the future they can still rely on our great service and guarantee system. Both these partners to our business have helped us compete in this ever changing computer internet driven world many thanks. Pollen Filter (Cabin Filter) or Not? Missed out by many garages on services? Having a pollen filter in your car is a relatively new concept, and was started off in Europe in the 1980’s. The USA already had pollen filters and different European countries had different standards, in their implications. Toxicology and Aerosol Research … http://www.item.fraunhofer.de/en.html This set the standards for the filtering of pollutants, including the filtering of pollens and other polluting substances that were pulled into the car through the air intakes and required to be filtered out. The pollen filter is changed when you are having your car serviced, but if you are a pollen sufferer in the Pollen Season (and there are millions out there who are?) then it would be advisable to have the Air Filters and pollen filters changed at the end of winter or the beginning of spring, this is certainly the worse time for the pollen to start affecting the poor sufferers. The thing I have also noticed is that pollen can start to affect people at any stage of their lives, so it would be wise to insist that your local garage or Unipart Car Care Centre (UCCC) should change the pollen filter at least once a year and preferably at the beginning of spring, to make sure the air entering your car will be as pollen free as possible. Other important filters not to ignore are the Oil and Fuel Filters. Please don’t forget that this can also affect your passengers, so make sure that the pollen cabin filters are changed, so that they will remove all the allergens from the imported and contaminated air from outside and act as Air Purifiers. Pollen is not the only thing that gets trapped in your pollen filter? When we remove the old pollen filter, we are amazed at the dirt and particles that the filter picks up, in just 12 months. The cabin pollen filter traps many different things that travel into the car from the exterior via the air conditioning and heating and ventilation system and these can include things like other cars exhaust fumes, bacteria general dust caused by insects and breaking up leaves that enter the front of your car and break up into tiny particles and finally will be trapped in your cars. If the driver does not change the pollen filter at regular intervals, like I say at least once a year in springtime, then it is possible that air in the car will begin to smell foul and will cause your passengers to inhale fumes and air particles as you drive them along, possibly making them feel ill. The blocked filter can also restrict the airflow into the cars heating and cooling system often causing problems and needing the help of your garage to spot the problem, a cost that could have been avoided had you changed the pollen filter. Most filters can be found in easy to access areas through access panels under the cars bonnet (hood), but we operate the Autodata manual that will tell us the exact location of these filters. We also fit an exact filter to the one removed and we use Unipart filters of the same quality as the car manufacturers have used. Another small point is that although your filters should change in spring time a more general guide is to have them change at 12 to 15ooo mile intervals. Many motorists do not appreciate the benefits to changing these pollen filters and are not aware of the health benefits of using them, but as I wrote earlier, these things are all scientifically studied are the findings have helped develop the product that we know as the cabin or pollen filter. Hi, I would like to introduce myself. I have worked in the Garage and tyre and Battery business now for 40 years, giving the motorists a Pollen Filter Change. I have worked for a couple of national tyre companies in my younger days, before starting my first business. I now own a garage and MOT testing centre, here in the UK called Pellon Tyre and Auto-centre, and I am a keen blogger about anything to do with cars and their related products that will help my business. We are members of Point-S and Motor-Codes and are also a Unipart Car Care Centre and, of course, Tyre-safe. https://www.pellonautocentre.com/wp-content/uploads/2015/06/Logo_PellonCleanTrans.png 0 0 Eric https://www.pellonautocentre.com/wp-content/uploads/2015/06/Logo_PellonCleanTrans.png Eric2018-02-13 17:59:112019-01-05 07:26:29Pollen Filter (Cabin Filter) or Not? Missed out by many garages on services? Change your Timing Belt it’s imperative? This Ford Fiesta cylinder head was badly damaged because the timing belt broke when the car engine was running. nowadays, is to take a contact number of the person who’s car it is having a service. Before mobile phones this would have been more difficult to do, but now most of our customers have some sort of mobile phone or other. The things we report on are such things as tyres or worn steering parts, these can be changed later on in the day if the customer is contacted and we will have time to carry out the repairs. One important thing though is the Timing or cam belt. 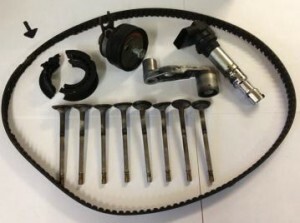 The Timing Belt Kits come in two types ,the chain type, which as the word say’s is very similar to a motor bike chain and a rubber looking belt, that looks very similar to a fan belt or the belt that drives your washing machine or spin dryer. This is made out of very strong material similar to the materials that tyres are made from. The importance of the timing belt cannot be overstressed. If the belt breaks in use then the engine can be damaged beyond repair. When we carry out a service we always check in the Autodata online manual, for the exact time for the belt to be changed. Sometimes it will state a Timing Belt Intervals and other times it may state a time period, but usually it will be between 60000miles and 100000 miles when the new belt should be fitted. blown up engine and no redress from the person that they bought the Old Cars from, so if you buy a second hand car you must only buy one with a history record and the knowledge of the timing belt, otherwise you could be caught out with a huge repair bill, always ask about the timing belt? A simple explanation of what this important part does is as follows; the timing belt is used to turn the camshaft at exactly half the speed of the crankshaft. Your camshaft controls the opening and closing of the valves in time to the pistons going up and down the engines cylinders. The camshaft belt runs on pulleys at the end of each important part and very often also drives the water pump. Should the belt break; then all these other parts simply smash into each, other causing major damage to the car’s engine. so the belt is subject to many pressures and eventually starts to break up and cracking starts to appear, once again very similar to tyres. Perhaps you can see now why it is so important to change the belt at the correct time, we also recommend that you change the water pump at the same time. The water pump runs on a bearing and the bearings tend to wear out at the same time. If the water pump is not changed and goes at a later date then the garage will have all the same work to carry out all over again. Many different companies makes of timing belt but we prefer to use Unipart belts, because as a Unipart Car Care Centre, our customers are covered under a warranty should anything go wrong with the part or the fitting of your new belt. You will be covered across the whole of the mainland UK, under the terms of the warranty a great protection to have. So to finalise if your garage warns you that the timing belt is due for a change well get it done as soon as you can afford to, before the thing breaks and causes much more damage to the car and to your wallet or purse. days, before starting my first business. I now own a garage and MOT testing centre, here in the UK called Pellon Tyre and Auto-centre, and I am a keen blogger about anything to do with cars and their related products that will help my business. We are members of Point-S and Motor-Codes and are also a Unipart Car Care Centre and of course Tyre-safe. https://www.pellonautocentre.com/wp-content/uploads/2015/06/Logo_PellonCleanTrans.png 0 0 Eric https://www.pellonautocentre.com/wp-content/uploads/2015/06/Logo_PellonCleanTrans.png Eric2018-02-12 18:00:032019-01-06 06:35:20Timing Belt Needs Changing Sir? the dreaded words from your mechanic?